Through using the right certified equipment and designing sound quality manufacturing systems, many food processing facilities are able to significantly reduce food safety risks and develop sanitary environments suitable for food processing. However, one rogue element will always remain. Humans, regardless of the sanitary environment in which they are working, still contribute the greatest risk to food processing environments. The prescribed solution to mitigating this risk is to ensure these individuals are given the time, tools and training necessary to facilitate proper food handling practices. However, our assessment of nearly 10,000 trained food handlers to date revealed that 41 percent of these workers still demonstrate a dangerous gap between their knowledge of food safety handling practices and their actual application of these principles in the workplace. People are dynamic. We don't simply do what we are told, and we can't be programmed like a computer to perform perfectly at all times. Our research and experience to date, and that of the food companies we work with, confirms our belief that sustainable safe practices within the food sector are best achieved when we go with the grain of human behavior. Only by effecting change in food handler behaviors will we be successful in embedding food safety within organizational culture, bring about meaningful improvement. NSF International combined leading research on human behavior and psychology with the organization's expertise in food safety to design an intelligent behavior-based food safety assessment model that helps companies build a culture of food safety. The model uses a range of assessments and interventions that were developed in conjunction with workplace psychologists and are designed to achieve sustainable safe behaviors at the lowest possible cost. Those food handlers who understand what they have been trained in. Those who do not understand certain areas (and what areas those are). Most importantly, those who misunderstand their training but have confidence in their knowledge. The last group are those food handlers who follow incorrect food handling practices with complete confidence and influence those around them to do the same. Food handlers who fall into this category are more pervasive than previously thought. 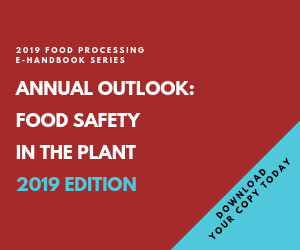 Our research on nearly 10,000 trained food handlers revealed that one-third fall into this category, posing a great risk to food safety systems throughout the supply chain. Dan Fone is business development director for NSF International's global food safety division. He is a food safety expert with more than 25 years of experience in the food industry, including extensive knowledge of safety management systems in the U.S. and Europe and helped design hazards analysis and critical control points (HACCP) systems for food facilities worldwide. NSF International will offer a seminar on the new behavior-based food safety training model this summer. For more information, contact Dan Fone at 734-214-6241 or dfone@nsf.org. The online assessment tool allows us to understand what factors are shaping food handler behaviors (e.g., cultural, attitudinal, lack of knowledge). Nearly three years of research, which included understanding key theories on human behavior (e.g., Social Cognitive Theory, Reason's Barriers, etc.) led us to the understanding that people will follow correct behaviors if they understand implications of getting it wrong and are confident in their knowledge. With the data we collected on food handlers, we can pinpoint bad food safety behaviors and then develop systems to reinforce the right food safety behaviors consistently and in the long term. Instead of applying a blanket food safety training program that may or may not work for all employees, we are able to intelligently apply strategic behavior-based programs in the specific areas where they are needed. This allows processors to get the most value out of their food safety training resources, while also making the greatest impact on food handler behavior.